Congratulations to our Client Liz and Roo for their feature on Indy’s Child Parenting Magazine! 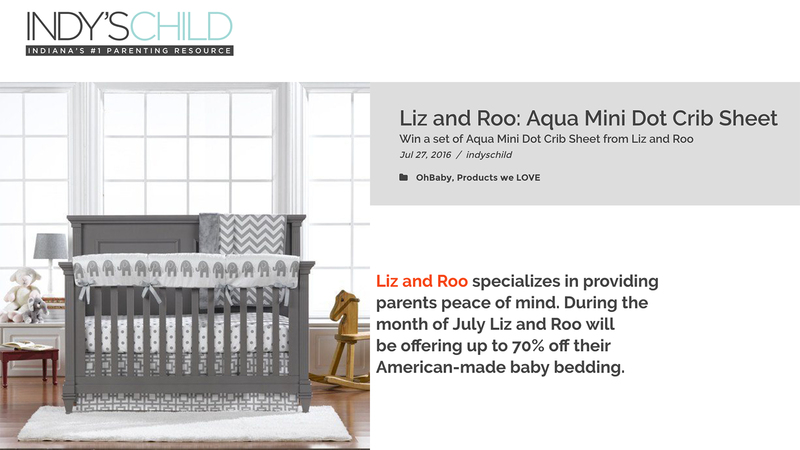 Liz and Roo offers ready-to-ship baby bedding sets and separates, including gender neutral bedding, baby bedding for boys, and crib bedding for girls. The ability to mix and match their modern baby bedding is an extremely popular and affordable option for a “customized” nursery. They offer over 75 fabrics to choose from and a full array of crib bedding products. Liz and Roo specializes in sheets that are constructed with a baby’s safety in mind. It’s extremely important for crib sheets to have elastic all the way around, and not just in the four corners. A sheet that comes loose could make it hard for a baby to breathe if it comes too close to their face. A high-quality sheet that will stay snug on the mattress, even after repeated washings, is ideal. Liz and Roo’s sheets are reinforced with a 360 degree, one-inch elastic band that goes all the way around the sheet. They have extra deep pockets that are 8″ to ensure a snug fit. They’re also made of durable all-cotton or linen/cotton blend. Check them out at lizandroo.com!